Apples are a major crop in the Pacific Northwest. They require a set amount of chill time (temperatures under 45 degrees Fahrenheit), but can also be grown in the home garden. The Pacific Northwest is generally defined as the area from far northern California to British Columbia in Canada. Apple trees thrive in cool climates, should be planted in full sun and require regular water. 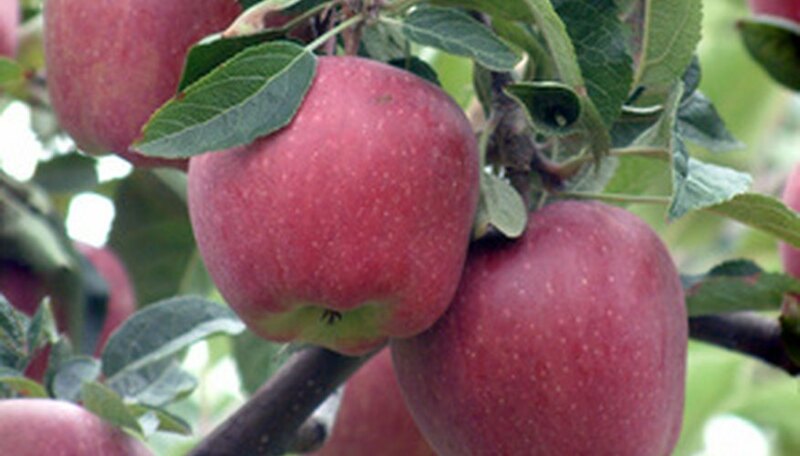 Developed in Japan in 1962, Fuji apples accounted for 14 percent of U.S. apple production in 2009, according to a Washington State University study titled "Overview of Tree Fruit Production in the Pacific Northwest United States of America and Southern British Columbia, Canada." Fuji trees, which are a cross between Ralls Janet and Delicious, produce an oblong fruit with yellow-green skin that has a red blush. Flesh is firm and crisp and has a sweet, but acidic flavor. Apples require up to 200 days to ripen and should be ready to harvest in late October. These apples store well. Introduced in West Virginia in 1900, Golden Delicious apples accounted for 16 percent of production in the Pacific Northwest in 2009, according to the Washington State University study. The trees produce a tall, yellow apple with a mild flavor. Flesh is crisp, but juicy. These apples do not store well and bruise easily. In the Pacific Northwest, Golden Delicious apples should be ready to harvest from the middle of September through late October. The trees are self-fertile. This distinctive green apple is round and squat with bright green skin and tart flesh. Granny Smith apples were introduced into the marketplace in 1850 in Australia, and accounted for 12 percent of Pacific Northwest apple production in 2009, according to the Washington State University study. These apples should be ready to harvest in late October and keep well. The most popular apple in the United States, Red Delicious apples accounted for 30 percent of production in the Pacific Northwest in 2009, according to the Washington State University study. Red Delicious apples accounted for as much as 65 percent of the crop in the 1980s. These apples are tall with deep red skin and white flesh streaked with red. The flavor is sweet. Red Delicious apples should be ready for harvest in late September.